Our goal was to compare measurement of tonometered saline and gastric juice partial carbon dioxide tension (PCO2). In this prospective observational study, 112 pairs of measurements were simultaneously obtained under various hemodynamic conditions, in 15 critical care patients. Linear regression analysis showed a significant correlation between the two methods of measuring PCO2 (r2 = 0.43; P < 0.0001). However, gastric juice PCO2 was systematically higher (mean difference 51 mmHg). The 95% limits of agreement were 315 mmHg and the dispersion increased as the values of PCO2 increased. Tonometric and gastric juice PCO2 cannot be used interchangeably. Gastric juice PCO2 measurement should be interpreted with caution. In recent years there has been growing interest in tonometric estimation of gastric intramucosal pH (pHi). More recently, attention has focused on the gradient between intraluminal and arterial PCO2. pHi appears to be a useful diagnostic and prognostic tool in critically ill patients, and may also be used as a therapeutic guide. However, intraluminal PCO2 is the parameter measured to calculate pHi, and it is assumed as equivalent to the PCO2 of the upper layers of the gastric mucosa. Direct measurement of PCO2 in gastric juice might offer advantages over tonometry. Tonometer costs could be saved, and equilibration time would no longer be necessary. Additionally, preanalytic factors that account for poor reproducibility, such as inadequate volume of saline in the tonometer, errors in the dwell time of the sample or in the technique used to aspirate saline, mixing of the sample with tonometer dead space and delay in analysis, could be prevented. Nevertheless, to our knowledge few experimental or clinical studies have examined PCO2 in gastric juice. Moreover, no comparison with simultaneous tonometric samples has been performed. Our goal was to compare simultaneous measurement of PCO2 in gastric juice and in saline samples from a tonometer. Data from the present study show that gastric juice PCO2 is systematically higher. Furthermore, differences widen at high PCO2 values, and data dispersion becomes even more striking. Therefore, tonometric PCO2 and gastric juice PCO2 are not interchangeable. The present study was approved by the local ethics committee, and informed consent was obtained from the next of kin of each patient. We studied 15 consecutive mechanically ventilated patients from a medical/surgical intensive care unit, in whom tonometric monitoring was indicated by attending physicians. All patients were receiving 50 mg intravenous ranitidine every 8 h. Gastric tonometers were filled with saline, which was extracted after 90 min of equilibration time. At the same time, gastric juice was anaerobically extracted from the aspiration port of the tonometer. The initial 20 ml was discarded. PCO2 in both samples was measured using a blood gas analyzer (AVL 945; AVL List GMBH, Gratz, Austria). These measurements were taken at various time points in each patient, and under various haemodynamic and oxygen transport conditions, All measurements were performed with the patient fasted. Correlation between the two measurements was examined using the Bland-Altman technique. We also performed an in vitro study to quantify the precision and bias for the AVL 945. For this purpose, a stable PCO2 in saline solution was achieved by bubbling 5% carbon dioxide calibration gas. We performed 112 pairs of measurements in 15 patients. Table 1 shows clinical data and the first values of arterial, tonometered and gastric juice PCO2 for each patient. 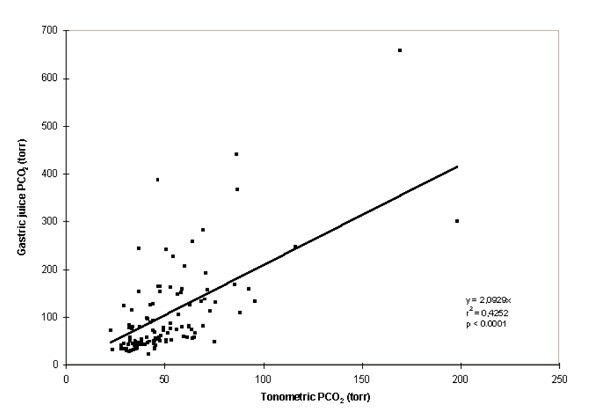 Regression analysis demonstrated a significant correlation between both methods of measuring PCO2 (r2 =0.43; gastric juice PCO2 = -28.79 + [2.55 × tonometric PCO2]; P < 0.0001; Fig. 1). However, the bias calculated as the mean difference of gastric juice and tonometric PCO2 was 51 mmHg. The 95% limits of agreement were 315 mmHg (Fig. 2). For mean PCO2 values lesser than 100 mmHg, the bias and the 95% limits of agreement were 19 and 102 mmHg, respectively. As mean PCO2 increased, the scattering of differences widened (r2 =0.71; P < 0.0001). In an effort to prevent the bias related to multiple measurements per patient, we performed Bland-Altman analysis with the first measurement of each patient. After this the results remained similar (bias 55 mmHg, 95% limits of agreement 216 mmHg). The AVL 945 blood gas analyzer showed a negative bias of 0.97 mmHg and a precision of 2.13 mmHg. This bias was considered negligible, so no further correction was made to saline tonometric values. The results of the present study show that tonometric PCO2 and gastric juice PCO2 are not interchangeable. Gastric juice PCO2 is systematically higher. At high PCO2 values the differences widen, and data dispersion becomes even more marked. There is no clear cause for these observations. A possible explanation might be that tonometric PCO2 is generated over a time interval, whereas gastric juice PCO2 might reflect rapid changes in mucosal metabolism. Different equilibrium time could also account for data dispersion, but not for the positive bias for gastric juice. Rapid changes should occur in both directions. Another potential confounding factor is the ability of blood gas analyzers to measure PCO2 in gastric juice. Measurement of PCO2 in 0.9% saline is an important source of error in the estimation of pHi. Variation in PCO2 values may occur with different PCO2 equilibration solutions. For example, bias is -66.5% when the Nova Stat Profile 7 blood gas analyzer (Nova Biomedical, Waltham, MA, USA) measures concentration of 1.95% of CO2 equilibrated in normal saline. However, bias changes to +45.4% when 1.95% CO2 is equilibrated in human albumin solution 4.5%. It would not be surprising if gastric juice components such as proteins, mucopolisaccharides and others interfere with CO2 solubility and its subsequent measurement by blood gas analyzers. In this way, intersubject and intrasubject variation in gastric juice composition could also account for data dispersion. Fiddian-Green et al  measured PCO2 in gastric contents of anaesthetized dogs. They isolated the stomach from the oesophagus and the duodenum with ligatures, and washed it through a catheter with saline. Then, they instilled 250 ml 0.9% saline and took samples to measure PCO2 and to estimate pHi. Simultaneously, mucosa pH was recorded with a microglass probe. They found a statistically significant correlation between both methods. However, data dispersion in the graph was considerable. We were able to exclude analyzer underestimation of PCO2 in saline as the cause for the present results. In vitro performance of the AVL 945 in blood was good. It showed a negative bias less than 1 mmHg and a precision of about 2 mmHg. We cannot infer from the present data the technique that should be the gold standard for measuring PCO2 in gastric mucosa. However, the studies that have established the normal values for pHi, prognostic changes and its uses as a therapeutic index have been performed with tonometry. Hence, more data are needed for the routine measurement of PCO2 in gastric juice. 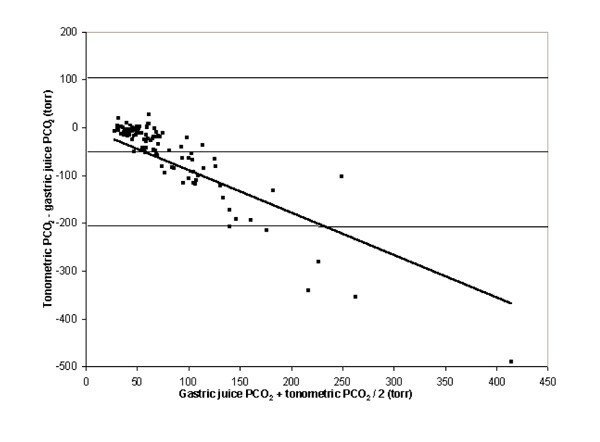 Correlation between gastric juice and tonometric PCO2. We performed 112 pairs of measurements of gastric juice and tonometric PCO2 in 15 critical care patients under different haemodynamic and oxygen transport conditions. The linear regression coefficient is significant. However, the slope value indicates systematic overestimation of gastric juice PCO2 in relation to saline PCO2. Bland-Altman analysis of the differences between gastric juice and tonometric PCO2. The bias calculated as the mean difference of gastric juice and tonometric PCO2 was 51 mmHg. The 95% limits of agreement were 315 mmHg. The bias and the scattering of differences widened as PCO2 increased. ARDS, acute respiratory distress syndrome. In recent years there has been growing interest in tonometric estimation of gastric pHi. More recently attention has focused on the gradient between intraluminal and arterial PCO2. pHi appears to be a useful diagnostic and prognostic tool in critically ill patients, and may also be used as a therapeutic guide [2,3]. However, intraluminal PCO2 is the parameter measured to calculate pHi, and it is assumed as equivalent to the PCO2 of the upper layers of the gastric mucosa . Direct measurement of PCO2 in gastric juice might offer additional advantages over tonometry. First, tonometer costs could be saved. Second, equilibration time would no longer be necessary. Finally, preanalytic factors that account for poor tonometric reproducibility, such as inadequate volume of saline in the tonometer, errors in timing the dwell time of the sample or in the technique used to aspirate the tonometered saline sample, mixing the sample with air from the tonometer dead space, and delays in specimen analysis, might be prevented . Nevertheless, to our knowledge, very few studies, either experimental or clinical, have examined PCO2 in gastric juice [1,6,7]. Moreover, no comparison with tonometric samples obtained at the same time has been done. Our goal was to compare PCO2 obtained simultaneously in gastric juice and in saline samples from tonometers. The results of the present study show that gastric juice PCO2 is systematically higher, and that for high PCO2 values this difference widens and data dispersion is even more marked. Therefore, tonometric PCO2 and gastric juice PCO2 are not interchangeable. The present study was approved by the local ethics committee and informed consent was obtained from the next of kin of each patient. We consecutively studied 15 mechanically ventilated patients from a medical/surgical intensive care unit, in whom tonometric monitoring was indicated by attending physicians. All patients were receiving 50 mg intravenous ranitidine every 8 h. Gastric tonometers were filled with saline and, after 90 min for equilibration, saline samples were collected, as has previously been described . At the same time, gastric juice was anaerobically extracted from the aspiration port of the tonometer. Initial 20 ml were discarded. A blood gas analyzer (AVL 945) was used to measure PCO2 in both samples. These measurements were taken at various time points in each patient, and under various haemodynamic and oxygen transport conditions. All measurements were performed with the patient fasted. Correlation between both of measurements was examined using the Bland-Altman technique . We also performed an in vitro study to quantify the precision and bias of the AVL 945. For this purpose, a stable PCO2 in saline solution was achieved by bubbling 5% carbon dioxide calibration gas. Bias (mean difference from expected PCO2) and precision (standard deviation of the bias) of PCO2 measured in saline was determined by comparison of measured PCO2 with expected PCO2. The latter was calculated from the carbon dioxide content of the calibration gas and from barometric pressure, according to gas laws. Measurements were repeated six times. We performed 112 pairs of measurements in 15 patients. Table 1 shows clinical data and the first values of arterial, tonometer and gastric juice PCO2 taken in each patient. Regression analysis demonstrated a significant correlation between both methods of measuring PCO2(r2 =0.43; gastric juice PCO2 = -28.79+ [2.55 × tonometric PCO2]; P < 0.0001; Fig. 1). However, bias, calculated as the mean difference between gastric juice and tonometric PCO2, was 51 mmHg. The 95% limits of agreement were 315 mmHg (Fig. 2). When mean PCO2 values were less than 100 mmHg, bias and 95% limits of agreement were 19 and 102 mmHg, respectively. The scattering of differences widened as PCO2 increased (r2 =0.71; P < 0.0001). The two types of measurements are clearly correlated. However, they cannot be considered as interchangeable, because gastric juice PCO2 was always higher and the 95% limits of agreement were clinically significant. In an effort to prevent bias related to multiple measurements per patient we used another approach, taking into account the initial measurement of each patient. Despite this, results continued to be similar (bias 55 mmHg, 95% limits of agreement 216 mmHg). The AVL 945 blood gas analyzer showed a negative bias of 0.97 mmHg and a precision of 2.13 mmHg. This was considered negligible, so no further correction was done to tonometric values. The present data show that tonometric PCO2 and gastric juice PCO2 should not be considered interchangeable,because gastric juice PCO2 was systematically higher. With high PCO2 values, this difference widened, and data dispersion became even more marked. There is no clear cause for these observations. It can be argued that tonometric PCO2 is a value that is measured over a predetermined period, whereas gastric juice PCO2 may generate data on minute-to-minute changes in mucosal metabolism. This different equilibrium time could account for data dispersion. However, the positive bias for gastric juice is harder to interpret, because such rapid changes should appear in both directions. Another potential confounding factor is the ability of blood gas analyzers to measure PCO2 in gastric juice. Measurement of PCO2 in saline is an important source of error in the estimation of pHi. The error lies both in the kind of blood gas analyzer used and in the PCO2 value itself [9,10]. Different solutions might modify PCO2 measurement. For example, bias is -66.5% when the Nova Stat Profile 7 blood gas analyzer measures concentration of 1.95% of CO2 equilibrated in normal saline. However, bias changes to +45.4% when 1.95% CO2 is equilibrated in human albumin solution 4.5% . It would not be surprising if different gastric juice buffers, such as proteins, mucopolisaccharides and others, interfere with CO2 solubility and its subsequent measurement. In this way, intersubject and intrasubject variation of gastric juice composition could also account for data dispersion. Therefore, analytic issues related to the various constituents of gastric juice could have added to the observed differences. Fiddian-Green et al  measured PCO2 in gastric content of anaesthetised dogs. They isolated the stomach from the oesophagus and the duodenum with ligatures, and washed it through a catheter with saline. Then they instilled 250 ml saline and intermittently took samples to measure PCO2 and estimate pHi, which was compared with simultaneous direct mucosa pHi measurement performed using a microglass probe. They found a statistically significant correlation between both methods, but there was considerable data dispersion in the graph. However, in that study, as well as in others in which PCO2 was measured without a tonometer [6,7], some kind of saline lavage was used. On the other hand, we directly measured PCO2 in gastric juice, which could produce marked differences in the results. Differences between tonometric PCO2 and gastric juice PCO2 could be due to blood gas analyzers that are calibrated for blood gas analysis, and could systematically underestimate PCO2 in saline [9,10]. Nevertheless, this explanation is not supported by the present in vitro results. The performance of the AVL 945 was fairly good. It showed a minor negative bias of less than 1 mmHg and a precision of approximately 2 mmHg. Thus, it appears to be a suitable device for saline tonometry. We ascribe the high PCO2 values obtained in the present study to shock and subsequent gut hypoperfusion, as can be deduced from the clinical characteristics of our patients. Also, in the presence of hydrochloric acid, duodenal or gastric bicarbonate buffering could produce important amounts of carbon dioxide . Although we cannot exclude spurious generation of carbon dioxide, measurements were performed in the fasted state, the position of the tonometer was checked by X-ray, and ranitidine was administered in each patient. If PCO2 in gastric juice and in the tonometer were interchangeable, their values would be similar, regardless of CO2 source or absolute value. However, gastric juice PCO2 and tonometric PCO2 were quite different. We believe that this is the novel point in this study. Gastric juice PCO2 has been used in some clinical studies [6,7,12]. Mohsenifar et al  advocated its advantages over tonometry. However, the present results suggest that the two techniques are not interchangeable. From the present data we cannot infer which should be the gold standard technique for measurement of gastric mucosa PCO2. Nevertheless, knowledge regarding pHi has evolved from gastric tonometry; studies regarding normal values, prognostic changes and its uses as a therapeutic guide were performed using tonometry. Hence, until more and clearer data are reported, PCO2 measurement in gastric juice should be considered with caution.